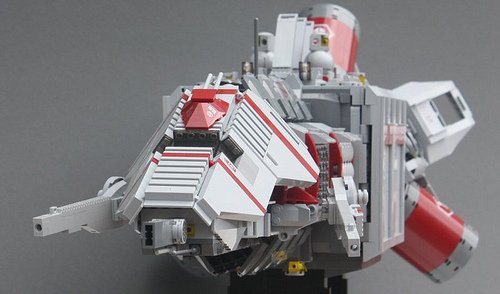 Kyle Vrieze (bermudafreze) displayed this deadly beauty of a SHIP at Brickworld. Unlike other ships, it carries combat cargo. Watch out ground forces, the last thing you might see is its shadow above your head. Beautifully menacing. Great details throughout! Didnt Kyle have this at Brickworld ’07 and ’08? ^It hasn’t been displayed here before. Touche, I was mostly unsure if it was a new mech transporter or still same one. ^Point taken. I have no idea if it has been at BrickWorld, since I haven’t made it one yet. I’m sort of addicted to BrickCon. Honestly, I’m a bit touchy about people implying that we screwed up when we post something that isn’t brand-new. I’m sure I jumped on your comment too quickly. My apologies. I’ll say this, Kyle definately beat us all (me, mark kelso, and some other guy (sorry some other guy)) fair and square… WITH HIS FREAKIN AWESOME SPACESHIP!!! !